We all know masculine cards are difficult to make. Teen (and pre-teen) boys are (for me, at least) even harder! So I thought I'd show you a couple of ideas that I used this autumn for some of our nephews. 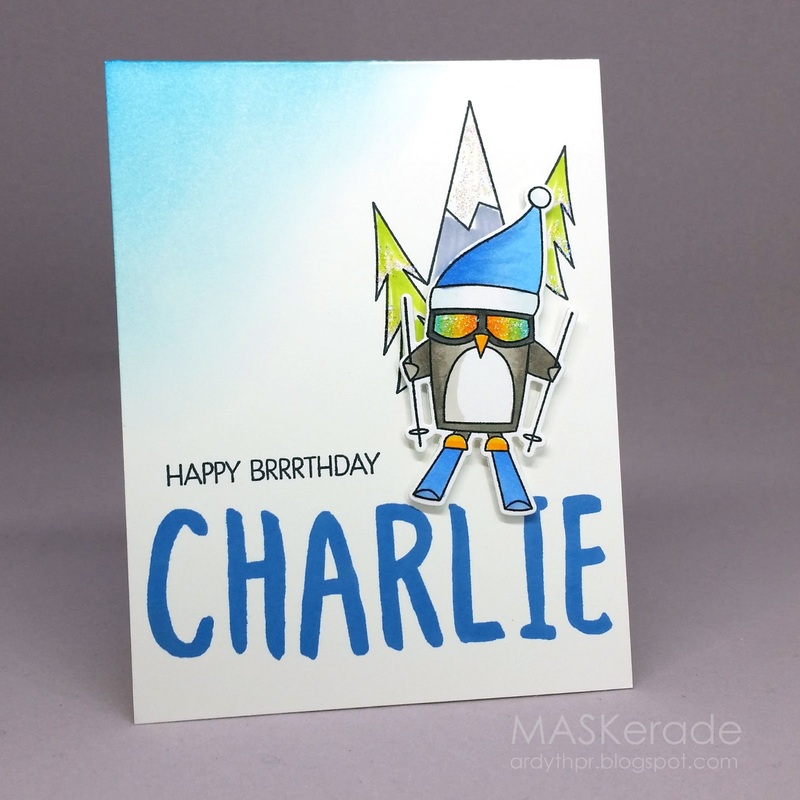 My first card uses MFT's new set Chill Wishes. Love the fun, punny sentiments and this super-cool penguin with his goggles. I coloured my goggles just like Keeway - so brilliant the way she captured the glare of reflective lenses! I used a Stampin Up Alphabet to personalize this one. My second card uses SugarPea Designs Every Day is Christmas and Celebrate All the Things as well as an old Stampin Up starburst stamp. I love how the background gives so much energy to this card. The frog is attached with a wobbler, so he really dances! Finally, the twins. These cards were made and sent just before the penguins arrived but you can see some continuity in my thinking. I used bold black and neon ombre inks to make these stand out. The Happy Birthday is from Essentials By Ellen's Sock Monkey set. The stars are from Winnie & Walter's Big Bang Confetti. Great "boy" cards, Ardyth! Love them! Your cards are perfect for guys! I am sooooooo going to CASE each of these cards! Will definitely save several trees and hours of 'meh' projects when it comes to creating guy cards! The goggles AND the starburst rock! 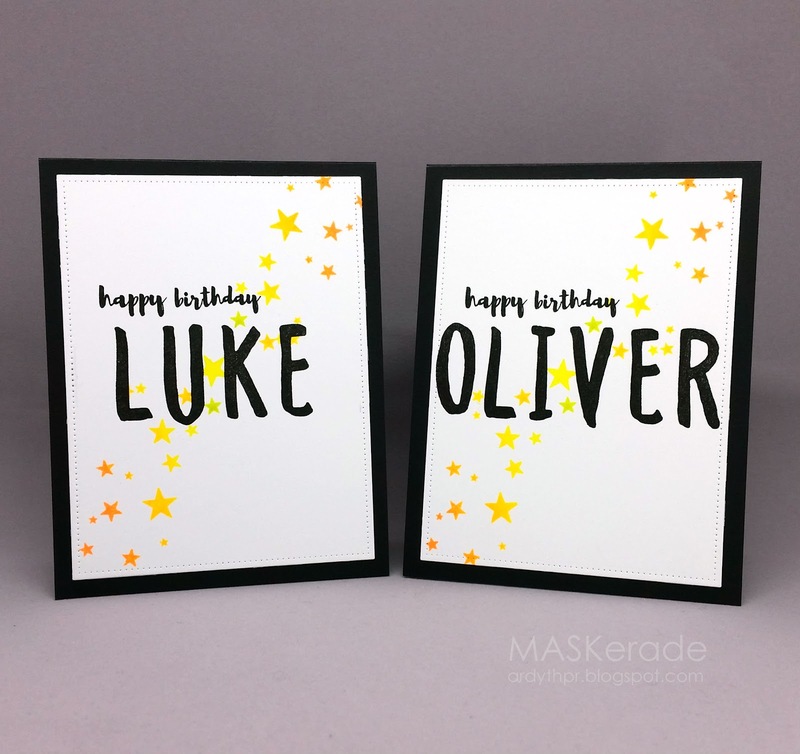 Love the personalised cards! And that fun penguin is just super! I agree... teen and preteen boy cards are probably the toughest! (Teen girl cards can be a little tricky too, to be honest.) These are perfect for guys! Those goggles, WOW. Well done Ardyth - these are stunning and so suitable for those' awkward boy years'. Perfect cards for the guys in our lives. I love the personal touch and had to go get that alphabet! Fabulous collection of birthday cards...so darn cute. All of these are brilliant! 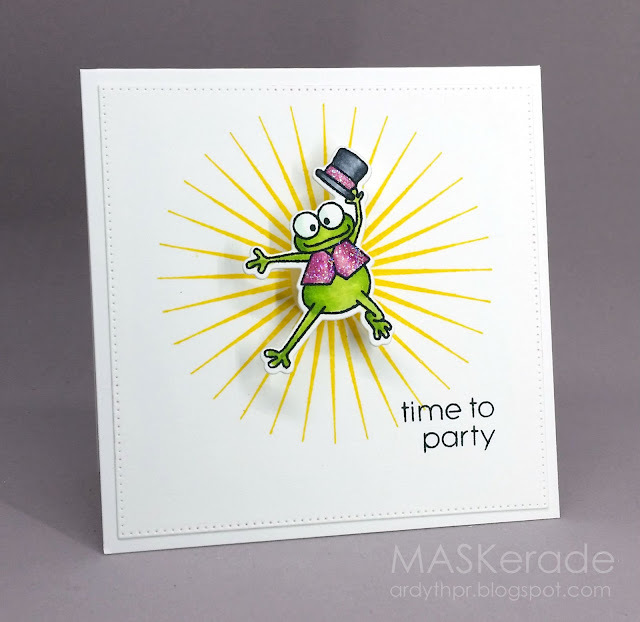 Loving the shine on the penguin's glasses, the sparkle on the froggie's vest and hat and the ombre stars. How CUTE are both of these!! Wow! I think you just showed us how it's done! Great job, and thanks for all the inspiration! These are all wonderful cards, Ardyth. The frog on the wobble is so much fun. LOVE these!! The glare on the sunglasses adds so much, what a fabulous idea to make them more realistic! And the shading on just the upper left corner of the card is a perfect space-filler, without distracting from everything else going on. One of my favorites! I really enjoy seeing what card makers send to their family, and I appreciate how you've personalized these.